A secrets contained in a mysterious scroll that has remained unopened for thousands of years has just been revealed — and it’s good news for Christian believers. 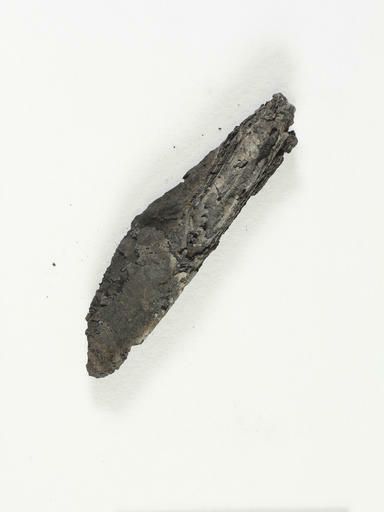 The mysterious, charred lump of a 2,000-year-old scroll sat in an Israeli archaeologist’s storeroom unread for decades. Scientists knew it was too brittle to open, so they couldn’t read what was in side. Now, new imaging technology has revealed what it contains: the earliest evidence of a biblical text in its standardized form. It’s proof of what Christian and Jews have claimed for centuries — the Holy Bible that was have today has remained constant through history, and that God’s infallible word hasn’t been changed by man’s influence since Jesus Christ walked the earth. The passages from the Book of Leviticus, scholars say, is the first physical evidence of what has long been believed: that the version of the Hebrew Bible used today goes back 2,000 years. The discovery, announced in a Science Advances journal article by researchers in Kentucky and Jerusalem on Wednesday, was made using “virtual unwrapping,” a 3D digital analysis of an X-ray scan. Researchers say it is the first time they have been able to read the text of an ancient scroll without having to physically open it. “You can’t imagine the joy in the lab,” said Pnina Shor of the Israel Antiquities Authority, who participated in the study. The digital technology, funded by Google and the U.S. National Science Foundation, is slated to be released to the public as open source software by the end of next year. Researchers hope to use the technology to peek inside other ancient documents too fragile to unwrap, like some of the Dead Sea Scrolls and papyrus scrolls carbonized in the Mt. Vesuvius volcano eruption in 79 CE. Researchers believe the technology could also be applied to the fields of forensics, intelligence, and antiquities conservation. The biblical scroll examined in the study was first discovered by archaeologists in 1970 at Ein Gedi, the site of an ancient Jewish community near the Dead Sea. Inside the ancient synagogue’s ark, archaeologists found lumps of scroll fragments. The synagogue was destroyed in an ancient fire, charring the scrolls. The dry climate of the area kept them preserved, but when archaeologists touched them, the scrolls would begin to disintegrate. So the charred logs were shelved for nearly half a century, with no one knowing what was written inside. Last year, Yosef Porath, the archaeologist who excavated at Ein Gedi in 1970, walked into the Israel Antiquities Authority’s Dead Sea Scrolls preservation lab in Jerusalem with boxes of the charcoal chunks. The lab has been creating hi-resolution images of the Dead Sea Scrolls, the earliest copies of biblical texts ever discovered, and he asked researchers to scan the burned scrolls. “I looked at him and said, ‘you must be joking,'” said Shor, who heads the lab. She agreed, and a number of burned scrolls were scanned using X-ray-based micro-computed tomography, a 3D version of the CT scans hospitals use to create images of internal body parts. The images were then sent to William Brent Seales, a researcher in the computer science department of the University of Kentucky. Only one of the scrolls could be deciphered. Using the “virtual unwrapping” technology, he and his team painstakingly captured the three-dimensional shape of the scroll’s layers, using a digital triangulated surface mesh to make a virtual rendering of the parts they suspected contained text. They then searched for pixels that could signify ink made with a dense material like iron or lead. The researchers then used computer modeling to virtually flatten the scroll, to be able to read a few columns of text inside. 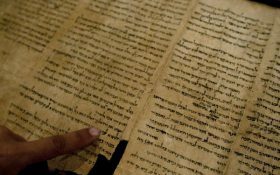 The researchers say it is the first time a biblical scroll has been discovered in an ancient synagogue’s holy ark, where it would have been stored for prayers, and not in desert caves like the Dead Sea Scrolls. The discovery holds great significance for scholars’ understanding of the development of the Hebrew Bible, researchers say. In ancient times, many versions of the Hebrew Bible circulated. The Dead Sea Scrolls, dating to as early as the 3rd century B.C., featured versions of the text that are radically different than today’s Hebrew Bible. Scholars have believed the Hebrew Bible in its standard form first came about some 2,000 years ago, but never had physical proof, until now, according to the study. Previously the oldest known fragments of the modern biblical text dated back to the 8th century. The text discovered in the charred Ein Gedi scroll is “100 percent identical” to the version of the Book of Leviticus that has been in use for centuries, said Dead Sea Scroll scholar Emmanuel Tov from the Hebrew University of Jerusalem, who participated in the study. Noam Mizrahi, a Dead Sea Scrolls expert at Tel Aviv University who did not participate in the study, called it a “very, very nice find.” He said the imaging technology holds great potential for more readings of unopened Dead Sea Scrolls. “It’s not only what was found, but the promise of what else it can uncover, which is what will turn this into an exciting discovery,” Mizrahi said. Sometimes we just have to trust that God is still in charge of passing on our knowledge of Him. Other times, like this affirmative discovery, God lets us know we still have His word correct. So begins the Gospel according to John. Do you believe it is true? Christ is the Living Word of Our Creator, Holy and Pure, forever superior to any and all written documents. My trust and faith is in Him, and nothing written – or influenced – by Man. I TOTALLY agree with you. I am a South African and I have experienced first hand the not so good translation of our first Afrikaans language bible from the English bible in the (if I remember correctly) 1950’s. Therefore I cannot but totally agree with you, when you watch documentaries on biblical subjects, you might hear stuff that can be quite amazing, in as such that Constantine was the person that decided which books must be in the Bible and which books should be left out. Also that certain books in the Bible was written not by the person whose name it has i.e. Marcus but by somebody totally different. That the Book of Judas were totally discarded. Also that some stuff were written say for instance 40 years after Jesus went up to heaven, now anybody can go and sit down and try and remember things to the finest detail that happened in your life forty years ago and let me tell you that is impossible unless you have written it down extensively at the time and even then you might one day read it again and realize you cannot even remember everything you yourself had written down. So in total agreement with the comment about human interference. YES, it is the only true WORD of GOD. As Acts 5: 29 “‘Then Peter and the other apostles answered and said, ‘We ought to obey GOD rather than men’. This is why we need and must get back to ‘putting Christ in the forefront again totally! Look at what our country has went to become, since we have turned our backs on Him and on GOD and our true Christian values! WE MUST GET BACK TO OUR CORE CHRISTIAN BELIEFS AND VALUES!! The more we use technology to understand our past the more I become aware of our need to return to the principals that have survived the test of time. 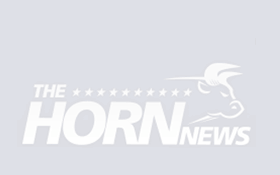 We are in decline as a nation as we move further away from the Biblical principals that our nation was built on. We must understand our history or we will find ourselves in jeopardy as a nation. Gods word gives the path, we need to understand and follow his leadership. If there ever was an eternal truth…it’s G-d’s WORD! This is a great find, being able to read the word of God, that has been hidden for many, many centuries. FantasticLuke 12:2 says there is nothing hidden that shall not be revealed. I second: Very nice indeed. GOD is a living GOD HIS word is living proof. May God, our creator continue to allow his people to understand his “Word” for us to accept his Path for us to follow!When you remove God from his Foundation to Life, we lose our existence! With Out His Word, we lose Our “Existence” and become of the World” and lose our “Salvation” thru Christ”! May Fod continue to show his people the way! Chistians have no need to fear technology. Everything we discover is likely to underscore the validity of the Bible. People don’t knowingly adhere to a book of lies for centuries. The Bible has managed to make it through history unchanged. We need to read it, obey it and trust its promises.